​All are welcome. We have a traditional, liturgical Sunday morning worship service and serve Holy Communion every Sunday. The worship begins at 9 a.m. with coffee and fellowship time following the service. Sometimes it is helpful to just have a moment of reflection. What better time than during worship. Each Sunday there is an opportunity to have a quiet moment of reflection, prayer or meditation during the distribution of Holy Communion. The Meditation Station is on the left side of the sanctuary. You can light a candle, leave a prayer, or just have a quiet moment. All are welcome to enjoy fellowship time with crochet hooks and knitting needles. 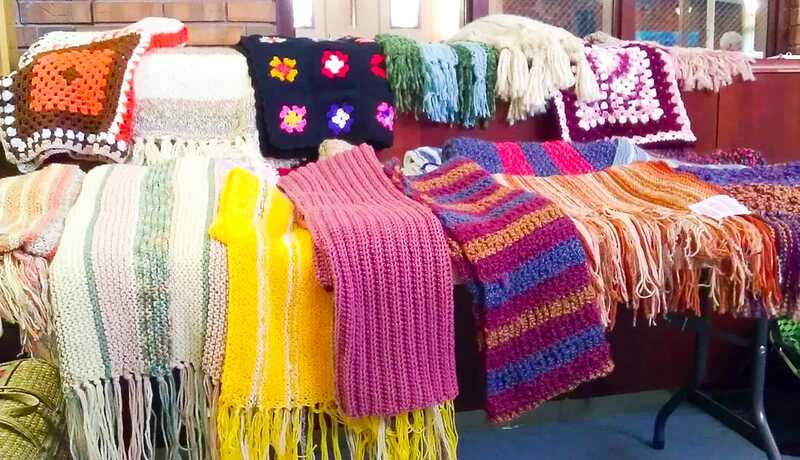 These shawls are given away to those in need of healing and prayer. Prayer Shawl gatherings are often twice a month on Sunday afternoons.